Posted by Florent Georges, on 2009-02-27, in oxygen and xslt. XSLStyleTM is a set of stylesheets to extract this information and format it to an HTML page. Besides this formating tasks, it also checks for best-practices (did you declare the type for parameters?, etc.) I think this is a very important piece in the XSLT writer's toolbox. Seting a project up to use XSLStyle is as easy as adding a tranform task using the XSLStyle's stylesheets to transform the project's stylesheet to HTML pages. And of course to add documentation to the stylesheets. All that is very easy, but you always have to remember where to installed XSLStyle, check for the namespace URIs to use, and the exact element names to use to document your code. Once again, that's very easy, but repetitive and time-consuming. I use oXygen more and more for a few months. And I really enjoy it. It helps a lot automating repetitive, time-consuming tasks: create a new stylesheet with the right namespace URIs, code completion for known vocabularies, tansform scenarii, etc. And for schemas, XQuery modules and WSDL definitions, it provides actions to generate documentation, the same way XSLStyle generates documentation for XSLT modules. Unfortunately, it does not support XSLStyle yet. Actually, the scenario attached to almost all of my stylesheets is the scenario using XSLStyle. But having XSLStyle integrated within oXygen would bring several advantages. It would always be installed alongside with oXygen. I am a freelance consultant and move a lot between different companies, using several computers, with different system administration policies. Thanks to the per-person-license model of oXygen, and its platform independence, I can take it with me everywhere, and be quickly productive, without having to install separately a JRE, Saxon, FOP, Xerces, DocBook environment, RELAX NG tools, Schematron skeletons, Emacs with nXML and others modes, and even Cygwin to be able to create shell scripts and Makefile to automate tasks. But I still have to download XSLStyle separately, open one of its stylesheets to copy and paste a documentation sample and the correct namespace bindings. Of course, it would be time saving to have an XSLStyle framework directly in oXygen. There would not have anymore the need to attach the stylesheet to an XSLStyle scenario neither. When I work on a stylesheet, I like to have its current scenario bound regarding what I am working on in particular. Switching back and forth between this scenario and the XSLStyle scenario does not really make sense. It would be more productive to have a Tools > Generate Documentation > XSLT Documentation... action as for the other file type, in my humble opinion. And finally, oXygen would even be able to report some documentation errors directly in the editor pane, as wrong names in documenting parameters. 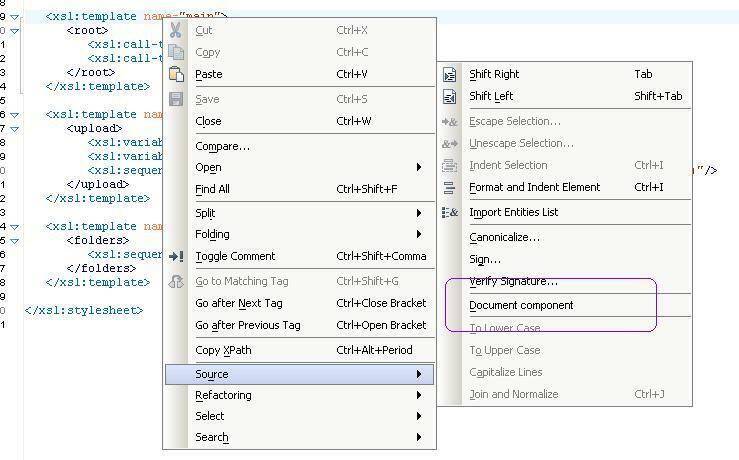 I hope oXygen team will be intersted to add support for XSLStyle, as this would be convenient, but also would spread XSLT writing best practices advocated by XSLStyle. Anyway, thanks to the team for listening to user requests, this is too rarely the case in other companies, and of course to Ken for XSLStyle. Posted by Florent Georges, on 2009-02-27T13:14:00, tags: oxygen and xslt.